Wet felting means getting your hands wet, wet felting soap means everything gets clean, especially around here, somehow, the floor gets wet, the dog gets wet, various people end up wet, Keeping a towel around might be a good idea. Bar of soap-natural soap is great for this! This is a potentially slightly messy process, even more so if you have little hands involved in the process. Be prepared for things to get a little damp. You can start by using the vegetable peeler on your bar of soap to make it just the shape you would like. Little hands may require assistance here, at the least supervision is required. Rounding the edges of the soap is often helpful, a wavy edge is easy to create and will look interesting. Have fun with shaping. Now get started with the wool. Lay out your wool on the corner. 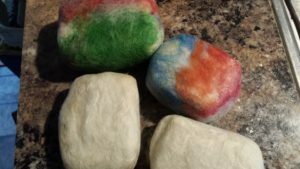 Use enough wool to wrap completely around your soap lengthwise. Now lay out your next piece of wool in a + shape, using enough to wrap completely width wise around your soap. Place your soap in the center of the + shape of wool you have made. Wrap the wool around the soap and make sure it is evenly covered, make especially sure any corners are covered. 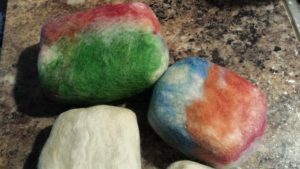 At this point you can add various colors of wool roving to make patterns around the soap! You can also leave it plain for later needlefelting. Place the wool wrapped soap onto the sheet of bubble wrap. Drip hot water onto the soap until the wool is wet. While you wet the wool, squeeze the bar gently to get the water into all the layers of wool. It shouldn’t take too long for suds to appear! An alternate choice here is to place the wool wrapped bar of soap into an old nylon stocking and tie it tightly. This can help hold everything in place while you work the wool into it’s final felted stage. Use the bubble wrap to wrap around the soap and rub the wool gently and with increasing pressure as it begins to felt. You can also rub the bar against the bubble wrap. The bubble wrap helps to agitate the wool and speeds felting. Continue to add water and rub until the wool has all shrunk tightly around the soap. At this point move the wool into cold water and rub a little more. This is a good time to check if it is felted as tightly as you would like, there shouldn’t be any loose, easily pulled pieces of wool. If you want it more felted move back to the hot water and apply more friction. Gently squeeze any excess water from the bar of soap after you remove it from the bubble wrap and let it air dry. 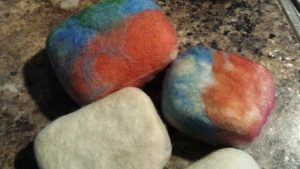 If you choose to needle felt, once it is dry is a perfect time to do so.